The thrill of the rolling ocean, waves crashing with the sound of low thunder, the sun shafting off the sea's surface, salt spicing the lips and the sensation of speed without mechanical means: surfing is an easy sell to those with even a slightly adventurous spirit. But this spirit can wilt when faced with the freezing Atlantic of Ireland's west coast; the surf might be promising, but the temperature is testing. Europe is another matter. Warmer water and more consistent surf make for a tempting Surf holiday Portugal package, and few spots rival Ericeira, a small town about 40 minutes' drive northwest of Lisbon, in Portugal. A gleaming new road winds its way from the capital through rolling hills towards the glittering coastline and this Atlantic surfing gem. We are staying in the Ecolodges, a group of wooden chalets around a lagoon-like pool, on the hills surrounding the village. The chalets are clean and comfortable, with all the facilities you need to cook for yourself, large bedrooms, plasma TVs and small verandas, perfect for sipping a bottle or three of wine while the sun sets. A large bar with books and a pool table, and a shady cellar heaving with wine, will keep you occupied if the rare rain comes. Outside is a glinting, slightly theme-park pool, with communal areas for barbecues. A 10-minute walk away is the heart of historic Ericeira. Along the fringes of the town, developments sprawl rudely among the hills, rough-edged and half-finished. The older quarter, though, is a charming maze of white-walled streets. The chatter and hum of families and friends spill out from the blue-doored houses; tiled plates proudly bear the names of the families who live within. This is an aged place, its white, smooth-tiled alleys polished by the feet of generations. This is not a braying mix of colour and alcohol, bustling and hustling its way through the inky Atlantic night; it is relaxed, sure of itself, with the low boom of the surf like the soft heartbeat of the town. Ericeira suits the temperament of the soul surfer; nothing needs to be done immediately, and most arrangements can wait awhile. Everything, that is, except the surf. Paddling out to the waves, you are suddenly aware of the power of the swell. The board rocks beneath your chest as you roll and dip beneath the peaks, trying to find a moment of calm to prepare yourself for the rush towards the strand. Turning slowly, with an eye behind, the anticipation kicks in. Keeping your body still, you hold position and wait for a wave that looks large enough to toss you beachwards with barely a thought. Waiting, waiting… and then an explosion of activity. A wave threatens to rear up as you paddle furiously while trying to maintain balance and generate enough momentum. The faster your board is traveling, the more stability is has and the easier it is to stand up- so you try to match the speed of the wave before it catches up and flings you towards the beach. A deep throb of sound and a freakishly strong rip of power sends your board surfing forward; from the strand it looks as if you are a struggling beginner, paddling gently along, barely afloat, but from the board it feels as if you master and commander, tenaciously battling the elements. Then comes the pop. Hands flat, near the shoulders, you throw yourself up, trying to snap your feet into a sideways stance, head up and crouching, facing the beach, willing the board to carry you an d pleading with your centre of gravity to hold its precarious place. Or that's the theory. Surfing is not an easy sport. The learning curve is more gradual than in skiing or snowboarding, say, which means lessons make an enormous difference. Surf Holidays, which we are travelling with, organizes its lessons through Na onda Surf School, and on this trip Tobi gives us effective, clear pointers that have us hooked in no time on a gentle beach break. The beauty of this spot for surfers is in no small part thanks to the variety of surf on offer; the Ribeira d'Ilhas beach is regularly on the Association of Surfing Professionals circuit, and Coxos break point is spoken of in hushed terms by pros. The beach breaks at the heart of the town are perfect for beginners and those finding their feet, so there's no excuse not to paddle out. To get a real flavor of the sport, the water doesn't need to be more than a metre and a half deep, so even those nervous in the drink shouldn't find it too threatening. The beauty of surfing is the relative lack of equipment. Just a board and a wetsuit and the ragged sounds and feels of nature; there is no jarring machinery, no mechanical contraption to strap into, little or nothing between you and the pure energy of the sea. This is also the perfect family holiday; with their irritating flexibility and seemingly effortless balance, children take to surfing much more quickly than adults and don't seem to tire after going 10 rounds with the sea. If the call of the surf starts to seem a little overwhelming, take a walk along the stunning cliffs, but be warned; the path is not exactly marked, and it is unfenced. Another surfing bonus is the hunger it opens up in you, a craving for crisp fresh salads studded with chunks of cheese, for whole fish fried and salted, slabs of meat, moist and smoky, gambas that melt like butter in the mouth and fiery piri-piri, all fuel to the fire needed to face the sea at first light. Ericeira has plenty of reasonable restaurants; among the best are Prim and Tik Tak, close to the Main Square, and Furnas, with a stunning location over the sea. Few things are better than a post-surf feast, washed down with a bottle or two of Portuguese vinho verde, a lightly sparkling mostly white wine with heaps of citrus. It's almost too easy to indulge, but remember to avoid losing the morning to a muggy, sluggish head, when you could be tackling a curve that could floor a giant and ride a hunk of water the size of a street into the knowing shore. Laurence Macking was a guest of Surfholidays.com (01-4822828, www.surfholidays.com). Aer Lingus (www.aerlingus.com) flies daily from Dublin to Lisbon. 2. Another option is to hire a car, so you can explore the coast at your leisure. 3. 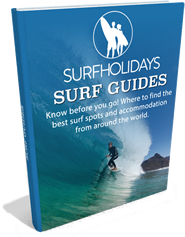 Surfholidays.com has a range of accommodation in Lisbon, as well as other surfing spots in Europe and Ireland. 1. Take lessons. Surfing is all about technique, so getting your stance and movement right from the get-go will mean you'll be standing on the board in no time. Get it wrong and you'll spend most of your trip in the drink. 2. Wear sunblock. Even if the weather is overcast and cloudy, sun bouncing off the water will act like a turbo sunbed. 3. Get a grip. Know when to let go of your board, to avoid getting a smack in the mouth, and know when to hold on, to make getting through waves less tiring and more fun. 4. Talk to other surfers. Most are only too happy to chat to absolute beginners, and they are the best people to check with for local knowledge and a quick weather and wave update. 5. Go surfing. If you've read this far, you're already half-convinced, and you definitely won't regret it. 1. Head straight for the deep end. When learning for the first time, it is unnecessary to go into water that is deeper than you are tall. 2. Give up easily. Surfing has a much slower learning curve than snowboarding, for example, so falling off and splashing around before you nail a wave is mandatory. 3. Go out alone; it's much more fun, and safer, with mates. 4. Put the board between the wave and yourself. Wave hits board, board hits face, surfer hits the deck. 5. Forget that it's a sport. Surfing is touch on the body, so do some warm-up stretching exercises and, as with swimming, avoid eating at least 45 minutes before going in the water.